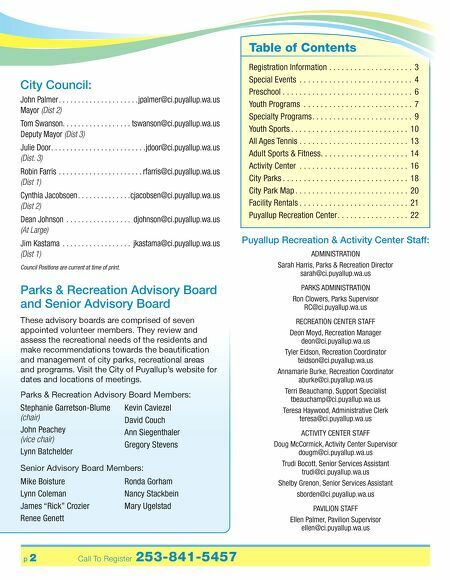 p 3 www.puyallupparksandrec.com Register online! We are now online! Register online for all classes and programs offered through the recreation department without leaving the house. Visit www.puyallupparksandrec.com to get started! In this brochure don't miss! • Daddy Daughter Dance – Page 4 • Preschool – Page 6 • Youth Sports – Pages 10-12 • Adult Sports & Fitness – Pages 14-15 Registration Information • Registration for January-April 2019 recreation programs begin Monday, December 10. • Registration can be done online, over the phone by credit card or in person at the Recreation Center. The Puyallup Recreation Center, is located at 808 Valley Avenue N.W. • Full payment for all classes and programs is due at time of registration unless otherwise noted. • All registration will be on a first-come, first-serve basis. 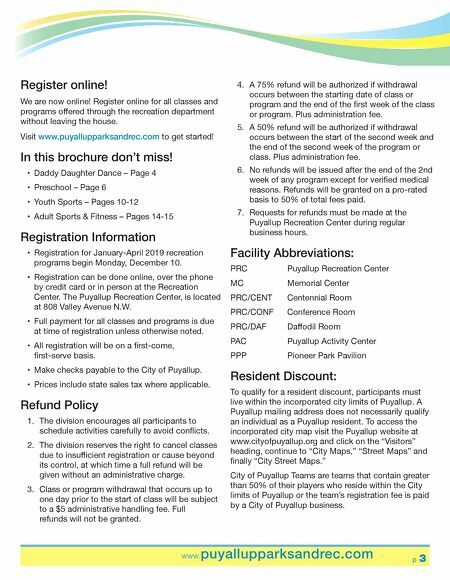 • Make checks payable to the City of Puyallup. • Prices include state sales tax where applicable. Refund Policy 1. The division encourages all participants to schedule activities carefully to avoid conflicts. 2. The division reserves the right to cancel classes due to insufficient registration or cause beyond its control, at which time a full refund will be given without an administrative charge. 3. Class or program withdrawal that occurs up to one day prior to the start of class will be subject to a $5 administrative handling fee. Full refunds will not be granted. 4. A 75% refund will be authorized if withdrawal occurs between the starting date of class or program and the end of the first week of the class or program. Plus administration fee. 5. A 50% refund will be authorized if withdrawal occurs between the start of the second week and the end of the second week of the program or class. Plus administration fee. 6. No refunds will be issued after the end of the 2nd week of any program except for verified medical reasons. Refunds will be granted on a pro-rated basis to 50% of total fees paid. 7. Requests for refunds must be made at the Puyallup Recreation Center during regular business hours. Facility Abbreviations: PRC Puyallup Recreation Center MC Memorial Center PRC/CENT Centennial Room PRC/CONF Conference Room PRC/DAF Daffodil Room PAC Puyallup Activity Center PPP Pioneer Park Pavilion Resident Discount: To qualify for a resident discount, participants must live within the incorporated city limits of Puyallup. A Puyallup mailing address does not necessarily qualify an individual as a Puyallup resident. To access the incorporated city map visit the Puyallup website at www.cityofpuyallup.org and click on the "Visitors" heading, continue to "City Maps," "Street Maps" and finally "City Street Maps." City of Puyallup Teams are teams that contain greater than 50% of their players who reside within the City limits of Puyallup or the team's registration fee is paid by a City of Puyallup business.